Culture Night Belfast: It’s Turning 10! The biggest evening in Belfast’s cultural calendar is set to celebrate its tenth birthday in super-psychedelic lovin’ style! The programme for the 10th Culture Night Belfast boasts over 230 family friendly, free events which are set to take place on Friday 21st September across the spaces and places of the city centre and beyond. Last year, over 100,000 people flocked to attend Culture Night Belfast and this year a similar figure is expected. The theme of this year’s Culture Night is “Love”, with the evening falling upon the UN International Day of Peace. From Street Countdown and the Camper Van of Dreams to the Culture Night PWU Wrestling Championships, the city is set to come alive for an evening of exploration and adventure. This year, Culture Night promises two world stages, a tap-dancing world record attempt, culture bites galore, live music, children’s activities and so much more. From The Big Fish to City Hall and Royal Avenue to St Anne’s Cathedral, those attending are told to expect “something new and surprising around every corner”. 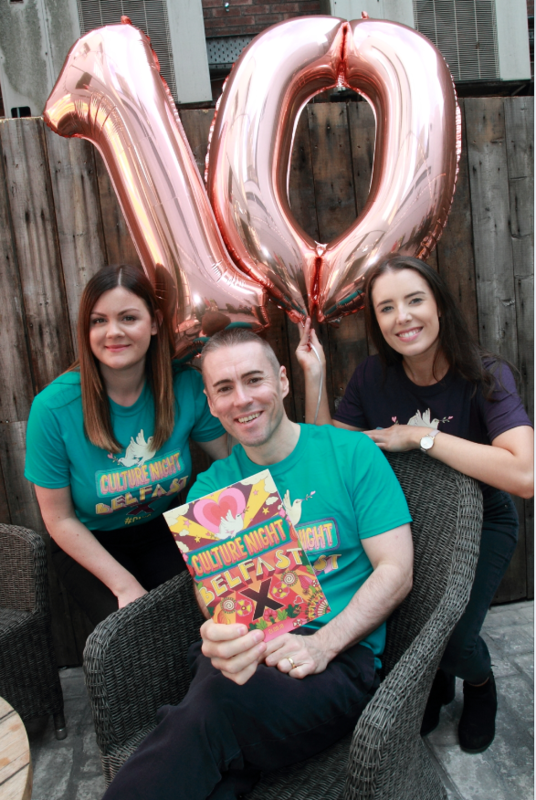 This year also sees the launch of the first ever Culture Night Belfast App, with goodies, extras and a brand new Culture Night Belfast planner, to design your very own personalised Culture Night experience! Claire Leonard, Kerry Rooney and Ruby O’Rourke.